Gas cylinders - Grodkowskie Zakłady Wyrobów Metalowych S.A.
Modern steel gas cylinders are 25% lighter than traditional cylinders. Light steel cylinders are made according to EN-14140 and 2010/35/EU instruction. Cylinders have a sign of safety π supervised by TÜV. Cylinders are made according to EN-1442 and 2010/35/EU instruction. 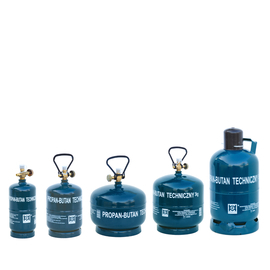 Cylinders have a sign of safety π supervised by notified bodies. The colour of cylinder and durable markings are made in accordance with valid regulations and requirements of a client. 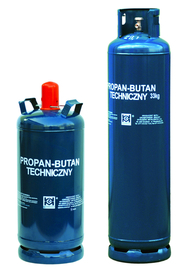 Cylinders are equipped with valves in accordance with PN-EN 849. Cylinders are made according to EN-1442 and 2010/35/EU instruction. Cylinders have a sign of safety π supervised by TÜV. The colour of cylinder and durable markings are made in accordance with valid regulations and requirements of a client. 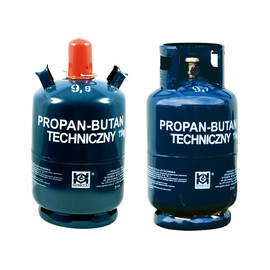 Cylinders are equipped with valves in accordance with PN-EN 849. Cylinders are made according to EN-1442 and 2010/35/EU instruction. Cylinders have a sign of safety π supervised by TÜV.